Malta was not, however, a place where someone could simply turn up unannounced. The whole island was a fortress, and security was tight. No one was allowed in from the mainland without a passport and papers prepared by the order’s network of receivers. Permission was granted only by the approval of the Grand Master of the Hospitallers himself. The Colonna’ had to have brokered this for Caravaggio, fleeing justice as he was. An army of slaves. They remain otherwise invisible to us, but I had no idea Valletta was built in only forty years, a planned city. 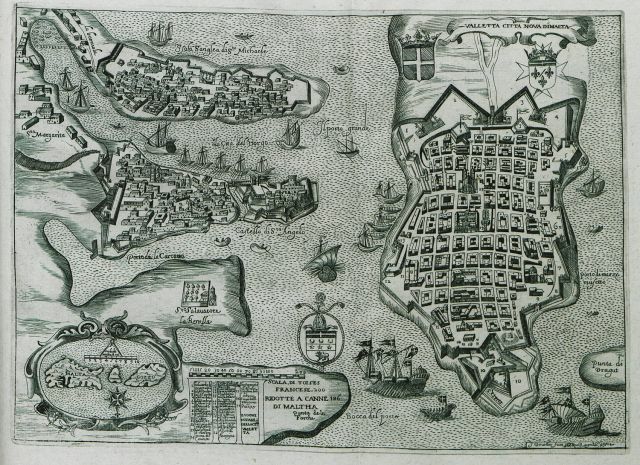 Within its walls, Valletta was laid out on the Renaissance model of the ideal city. The principal architect responsible for the buildings was Girolamo Cassar, who was from Malta but had studied in Rome. His palaces and churches were designed to reflect the knights’ ideals of Christian sobriety and military discipline, with long, sever facades of rusticated stone. The streets were laid out in a grid, with nine thoroughfares running across the peninsula and twelve running from top to bottom. Their strict geometry was softened by gardens and fountains. adieu, ye cursed streets of stairs. Approaching Malta for the first time, Caravaggio was surrounded by symbols of the island’s fierce rule of law. On the first promontory on the left of the harbour was the forbidding spectacle of a gallows. Within the harbour itself, prominent on the left-hand side, was the Castel Sant’Angelo, where many of the most famous events of the siege had taken place… it had become a prison for disorderly knights. At the end of the the sixteenth century, a visitor, Hieronymus Megiser, noted gore still visible on some of the rocks and pointed out by his guides. A ‘remote and harsh place, rocky and sun-parched’, yet famed for the sweetness of its honey, quantity of almonds, olives, figs, dates, the quality of its cotton. Cicero had his clothes made there. I have failed to find English translations of Hieronymus Megiser’s descriptions of Malta, so shall quote what Graham-Dixon has gleaned from them. As Megiser notes, the island encompassed two utterly distinct societies. ‘Malta Africana’ and ‘Malta Europeana’. The world of the indigenous islanders had remained unchanged for centuries. Its people were dark-skinned, spoke a language incomprehensible to Europeans and lived in humble settlements much like the tribal villages of nearby coastal Africa. Cosmopolitan Valletta was utterly different, a flammable blend of extreme Christian piety, simmering military aggression and barely contained sexual dissipation. I am fascinated by this duality, but there is no more to be found here about it. George Sandys was an English traveler — quoted liberally throughout the volume, and his descriptions of Malta are fascinating. But I have found those, and will read them as they look amazing. It is not known where Caravaggio lived during his time on the island. Prospective knights on their first tours of duty were given accommodation in the auberge belonging to their particular Langue, or country. Altogether there were eight Langues, of Italy, Provence, Auvergne, England, France, Aragon, Castille and Germany. Langue meaning language more like? Because Italy was not yet a country, nor was France or Germany in the shape we know them.But Caravaggio probably lodged with the Colonnas anyway, they were the only one’s who knew he was there and of his plans to become a knight — this was not brokered until the winter of 1607. I get to see this. So exciting, Caravaggio’s largest altar-piece still sitting in the place for which it was painted. The novices of the Order of St John [of whom Caravaggio was one] listened to sermons and received instruction in the oratory for which Caravaggio’s painting was destined. The place was both a school for the martyrs of the future and a burial ground for the martyrs of the past — the bones of the knights who had died at the Great Siege were interred beneath its stone-flagged floor. … Caravaggio’s altarpiece was designed to make sure that they [the novices] could be under no illusions about what that might mean. Not that I am at all keen on martyrs, particularly not crusaders. But nor, I think, was Caravaggio. He did, however, paint a wonderful portrait of Alof da Wignacourt (c1607-1608), the Master of the Knights. Caravaggio was pretty determined to get a knighthood, and this was a man of fairly absolute power. And yet Caravaggio still ensures that his page rather steals the show. He still rebels I think. While there he became friends (if that is possible to guess at) with WIgnacourt’s secretary Francesco Dell’Antella. Graham-Dixon notes he was a gifted draughtsman and produced a detailed drawing of Valletta — which I have found. This is the ‘Map of the medieval town of Valletta, with Senglea and Vitoriosa at the Great Port. 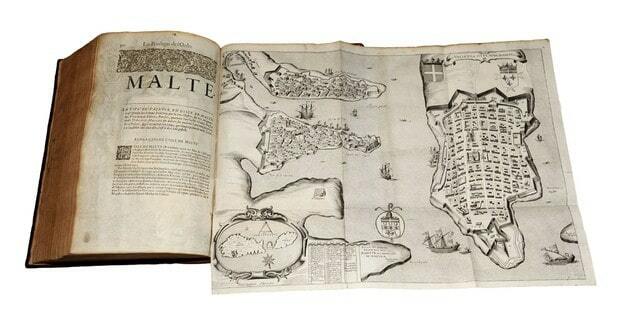 Map of Malta and Gozo’ from [BOISSAT, Pierre de / BOSIO, Giacomo]. 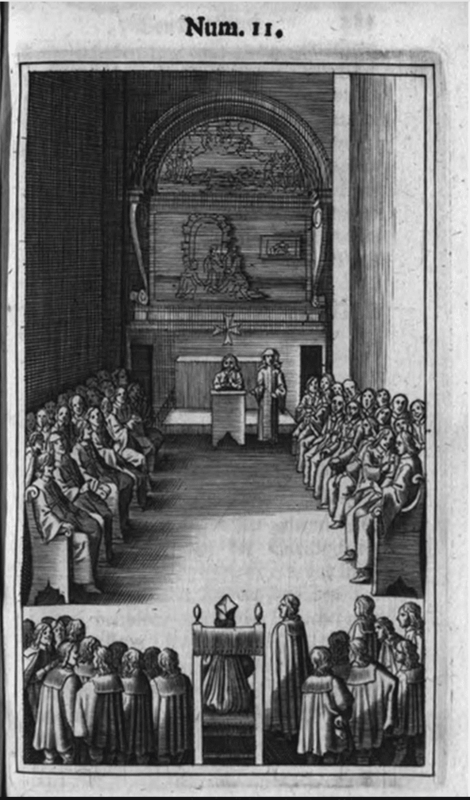 Histoire des Chevaliers de l’Orde de S. Jean de Hierusalem, contenant leur admirable Institution & Police…, Paris, Jacques d’Allin, MDCLIX [=1659]. 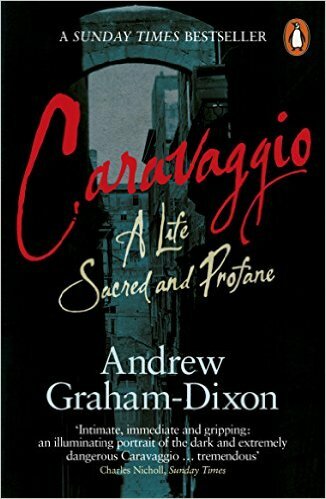 ‘Finally,’ Graham-Dixon writes, ‘Caravaggio had got his own gold chain.’ I forgot to mention the animosity raised in Rome when a rival received such a chain — the one about whom the scurrilous verses had been written. There is no context given for the slaves. Slavery remains only part of the background throughout, which kills me. 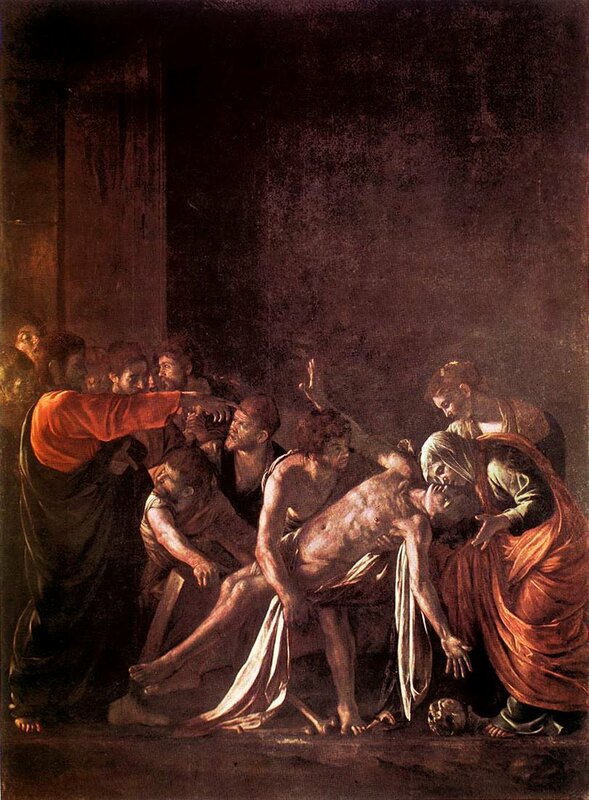 Still, Caravaggio got his Knighthood, with approval of the Pope. He was thus above the law for the murder he had committed, could return to Rome with new rank. 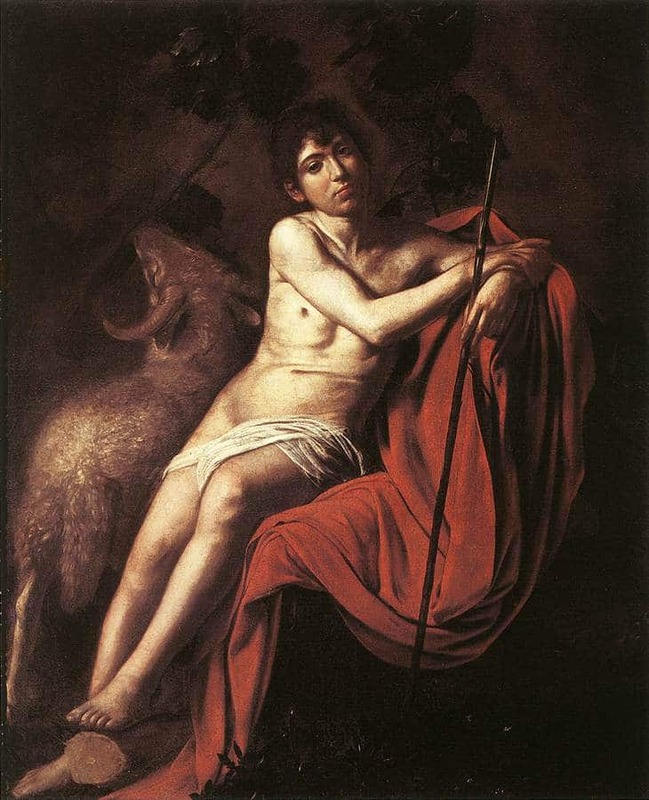 Graham-Dixon notes that in this whole scheme to elevate himself, perhaps Caravaggio had not realised that as a knight, he had to have Wignacourt’s permission to leave Malta. 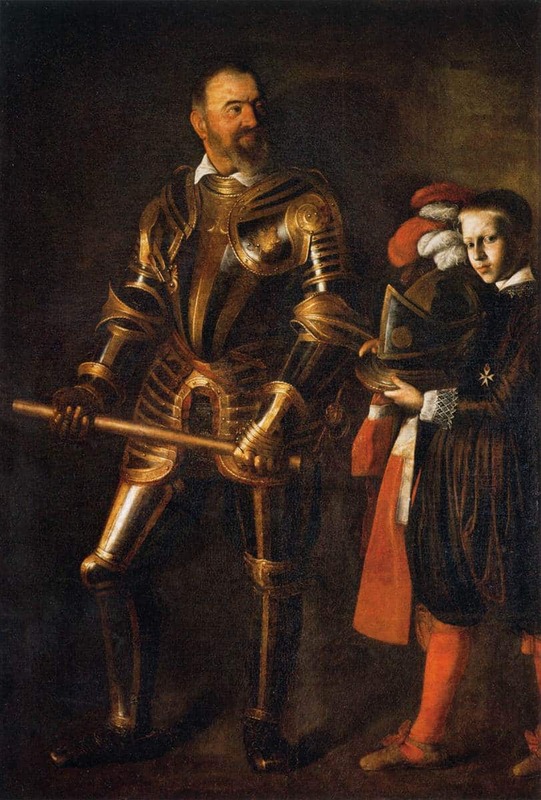 A permission unlikely to be granted for some time, if ever — in Wignacourt’s petition to the Pope to be allowed to confer the knighthood, he noted the purpose of it was ‘to keep’ Caravaggio. Ominous. Graham-Dixon argues the dawning realisation that he was trapped, as much as his unruly habits, explains the end of Caravaggio’s time on Malta. 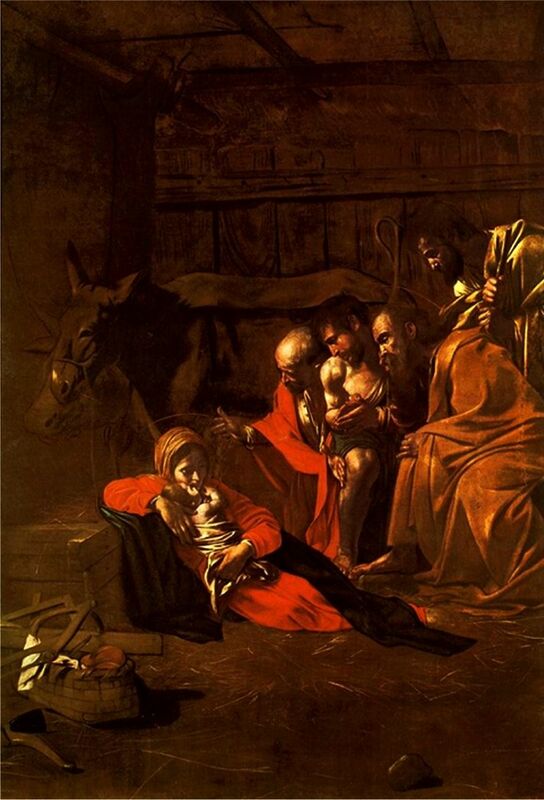 The musicians were unhappy about their pay and most of them went on strike, so that on the feast day itself neither Vespers nor the solemn Mass was sung in the oratory before Caravaggio’s picture. This happened in Caravaggio’s absence of course. He, in the meanwhile, had fled to Sicily, meeting up with an old friend and painter Mario Minnitti (also the model for Boy Bitten by a Lizard and others) and traveling through Southern Italy. 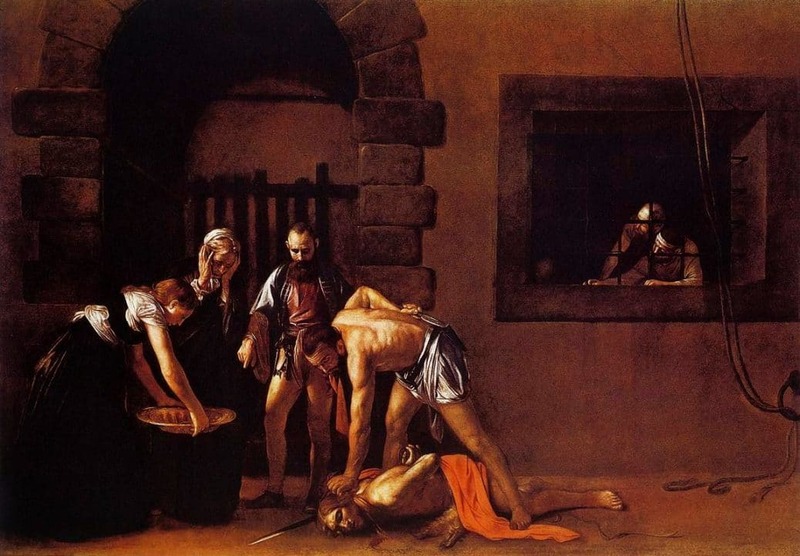 Caravaggio believed he was being followed, and that his life was in danger. His routes were most circuitous. And the Raising of St Lazarus in Messina. 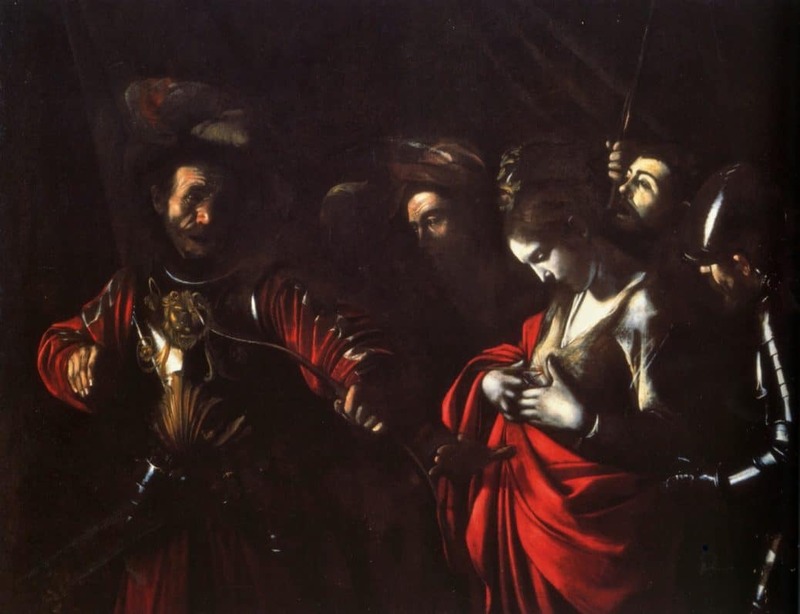 Graham-Dixon notes that the Lazzari family had originally wanted a picture whose proposed title would have been ‘The Madonna, St John the Baptist and Other Saints, but Caravaggio negotiated with them to paint this instead. In Rome at the height of the Renaissance it had not been unknown for a famous artist to alter the terms of a commission. Michelangelo had famously plucked up the courage … But in the provincial artistic milieu of Messina, Caravaggio’s assertion of independence was still being talked about a hundred years later. In 1609, also in Messina, the wonderful Adoration of the Shepards. By September of 1609 he had returned to Naples, and the protection once again of the Colonnas, both Bellori and Baglione mention the enemies chasing him. Graham-Dixon argues that this return to the Colonna fold means that both his patrons had forgiven him for his escapades on Malta, but also that they had negotiated a truce with the knights there. His fear was well-founded, he was severely wounded in an attempt on his life as he emerged from the Cerriglio — a rather famous brothel, his face disfigured — sfregiato, an injury inflicted to avenge an insult to reputation. Probably by Rodomonte Roero, the Conte della Vezza, who had indeed, almost certainly, been tracking him. Caravaggio never really recovered. 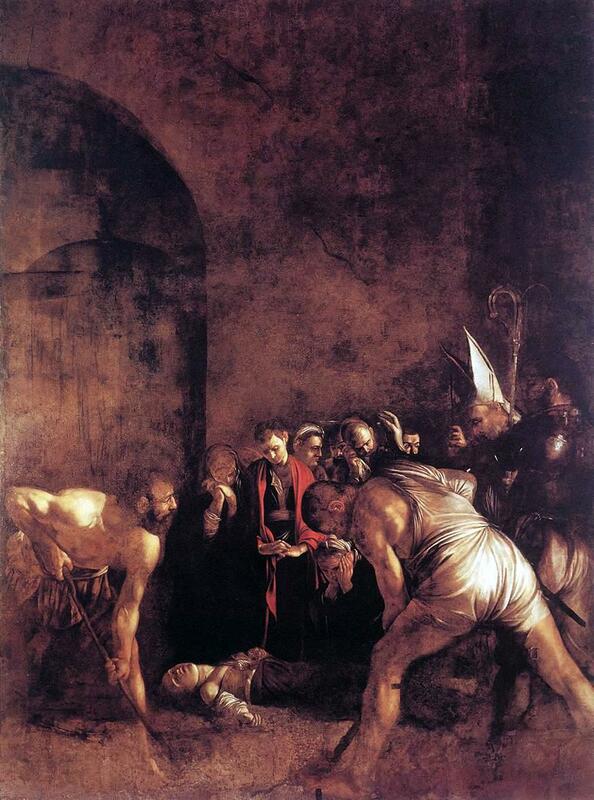 In Naples he painted the Martyrdom of St Ursula (1610), thought to be his last picture. He traveled to Rome, with either a pardon in hand or on its way, and the lack of clarity surrounding his death seems characteristic of most of his life. He was arrested when he disembarked from his boat at Palo, a fort manned by the Spanish. Something went wrong and he was arrested, thus his belongings and the three paintings he had brought with him made the rest of the boat’s journey to the Porto Ecole. Bellori has him running from Palo to Porto Ecole and dying on his arrival from heat and exhaustion — but it was days on foot between the two. He did die in Porto Ecole, however, of fever, in July of 1610. Then the feeding frenzy was on over the paintings he had left behind him. This is one, an uncommissioned painting of melancholy treating a subject he had painted several times before. To me it embodies both his queerness (which I know I don’t look at enough here) and his regret and suffering. A life that as I say, troubles me and sits with me.